If you are interested in Zoom Player MAX, be sure to (a) subscribe to their newsletter, (b) visit their website, and (c) see their online shop. There is a learning curve but it’s not difficult. The sound is nice and there are presets for rock, classical etc. Thanks for providing quality software. I cannot say enough good things about this media player. For the last 25 years or so since I got my first computer and started using media players, Zoom Player MAX is absolutely the best I’ve found. The picture and sound quality alone leave all the other media players I’ve tried and/or bought over the years in the dust. In addition to their outstanding product, their customer service is first class. Whether you call them before buying the product, to ask what I thought was a silly question, but was reassured by them that there was no such thing :-) I highly recommend Zoom Player MAX and urge anyone not using it to try it. You will not be disappointed! It supports an enormous amount of files for playback, everything is adjustable even audio and video decoders ! It’s perfect for eveyone that likes freedom and uses lot’s of file formats. On their forum you get professional help that solves your problems verry fast ! Only downside is that you can not play blu-ray movies without a program that unlocks them. Media has become an important part of our everyday life. It is very difficult to find a person who does not watch movies or listen to music. With advancement in technology media has evolved to many different formats that provide flawless quality. But to enjoy these formats with their best and highest qualities, we need a media player software. Most existing media players have plenty of useful and interesting features, but, unfortunately, they lack many others. Zoom Player MAX is an exception to the rule. It is a powerful media workstation capable of running nearly any media file out there. Zoom Player is one of the most Powerful, Flexible and Customizable Media Player application for the Windows PC platform. With a simple and straightforward installation process, it can be pre-configured to suit your devices like desktops and laptops, home theater PCs or touchscreen devices. It has perfectly combined a well thought-out user interface along with easy to use basic functions on the one hand and a number of flexible and more powerful features on the other hand. Moreover it has a good preview section, playback options are clear and skin colors can be customized, downloadable content is also supported. – The interface is well-arranged for ease of use, the controls are presented in a similar way to that of other media players. The player also has three different modes to give you optimal controls depending on the file that you are playing. The three modes are Audio Mode, Media Mode and DVD Mode. Media mode represents the basic look and feel of a media player whereas audio mode turns off the preview section so that it does not take up necessary space on your desktop. DVD mode provides a set of dedicated content navigation options. – Files can be loaded by dragging them over the main window, or through the dedicated explorer. The playlist manager contains all the inserted files, and also lets users save and load already existing playlists. These extensive controls make Zoom Player a powerful and suitable tool for users like me, who have a huge collection media content. – This media player lets you enhance, fine-tune, and boost the sound that reaches your ears. The integrated equalizer contains several well-set presets to give your media audio enhancement upfront. For advanced users who know how to tweak around with sounds, it lets you save your own configurations. – Almost all the controls and features this media player provides can be can be assigned a custom combination of keys. Customizable mouse gestures are also present. This makes the users save a great deal of time, and makes everything more comfortable. – Although this media player presents everything in a well-arranged and simple way, there are still a few features which novice users will not get at all. It will take them some time to be able to finally understand and utilize them. – Streaming does not work for most of the sites, however the only link that successfully worked was from Dailymotion. Other links like from YouTube gave an error and did not work. – Being an audiophile, I love to tweak around with sounds to suit them to my liking. The equalizer provided is not really advanced in features, but it does it job very well and provides the playback sound I look for. – For power users it is of great importance, it makes the tasks so easy and saves you a lot of time. Zoom Player MAX 13.5 comes fully equipped with all it needs to be able to handle media files flawlessly, doing its job with amazing precision. Taking everything into account, Zoom Player MAX does not fall even an inche short to the alternative media player giants. If you’re tired of your existing media player, are looking for replacement, or want a more advanced media player than your current one. Zoom Player MAX is definitely worth trying out. this play also has other cons so i suggest every one create a restore point before installing any new apps. i tried zoom and found that it caused my DVD creator and my winx video converter software to fail. it appears that the software package loaded by zoomplayer took control and changed certain functions in these two apps. WHY THIS HAPPENED I HAVE NO EXPLAINATION TO GIVE… i uninstall and reset using a manuel restore point. now my software works again. just wanted to send this out to u and other user. A couple of years ago I was actively searching for the best player for Windows OS. After so many player installs and trials, I finally narrowed my options to two: VLC Media Player and Daum Potplayer. Since then, I am yet to choose the best. However, it seems the curiosity to find out what other players can offer never went away. That is how I bumped into Zoom Player MAX 12. After playing around with it, this is what I found. The best approach during installation is choosing the default option. Before completing the process, you may choose to install extra components or not. However, the extra components will make your installation piece more versatile in terms of the media files it can play. Depending on the device you will be using, this player will give an option to pre-configure it to match its needs. Although Zoom Player MAX 12 has an interface with options reminiscent to those of media players I have used in the past, it presented a breath of fresh air. One of the things that caught my eye was the way it was able to pull details of audio files as they played. In addition, it also showed the current time as the audios were playing. The player also gives two modes for you to choose. There is the DVD mode and Media mode. With the two modes, you get optimal control depending on which file you are playing. For the past few days that I have been using Zoom Player MAX 12, my playlist was quickly filling up as I prefer listening to music in albums. Thankfully, the player has a search option that I found useful every other time to search for particular songs in the playlist. Closely related to that function was the sorting feature. With this option, I was able to sort the files in playlist in terms of name, date, type, duration, and size. As a result, accessing them was easier than I had imaged. One of the things that really got me hooked into trying out this player was the video and audio files it could support. True to that, I had an easy time playing all the media files on my hard drive without having to switch between players. In addition, it also plays DVDs and BluRays. The player has a rather user friendly interface. However, there are some subtle options and controls that would require one to get used to. To novice users, such options will take them some time before learning how to use them. As I was exploring Zoom Player MAX 12, I noted the Add URL option. However, on adding and trying different streaming URLs, I did not seem to work. That was disappointing. You will a reliable player in Zoom Player MAX 12. Its wide media file type support and rather intuitive interface will present that much needed smooth playing experience be it on your PC, tablet or custom media center. It is a worthy download. my native Windows Media Player isn’t so good at handling multiple file formats. Though there are many veteran players to replace this, Zoom Player MAX 10 is an ultimate attempt at levelling the playing ground by giving me something that looks different and works as amazing as other competitors like VLC and GNOME. 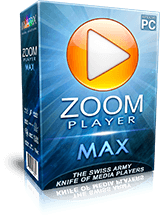 Free Zoom Player Max 10 is an impressive high customizable media player that works with the equally impressive Smart Play Technology. Couple this with the support for a wider range of media formats and an acceptable stability and you get a player that will let take charge of your media no matter how huge your media library is. Zoom Player’s shortcuts center around the direction keys and enter. This is more than enough to control all your player features. If you want something more advanced, you will have to try the advanced menu bar. Everything, from file browsing to playlist and playback control has been thought of in this player. Extensive control options let your bookmark, enhance or access your previous play history. These features make it a powerful tool to users who own huge media libraries and want to manage them easy. A highly powered user interface could intimidate an armature. Zoom Player neatly tacks away all the advanced editing features and only shows them to you when you actually need them. This makes the player an amazing tool to both professionals and the armatures. The install center will scan your system and make any necessary media component updates. This is quite neat especially if you don’t do any frequent updates on your own. Sometimes, firewalls and antivirus software might be too cautious. It will dislike anything that requests too many permissions or utilizes approaches similar to what malware uses. Good developers should know this and look for acceptable ways to getting the job done. I thought the intelligent playlist integration will learn my playing styles better and give me the right videos whenever I play the first video in a day. I was wrong. Any slight tag misuse or folder misplacement will throw the player off its footing. The super control over video, color and audio makes it an amazing tool to refined watchers who pay attention to HD video. Don’t expect fireworks when it comes to intelligence, and the library management system though.